While Star Wars: The Force Awakens brought back nearly all of the classic characters, there was one who was only represented by a burned out mask and some brief theme music. 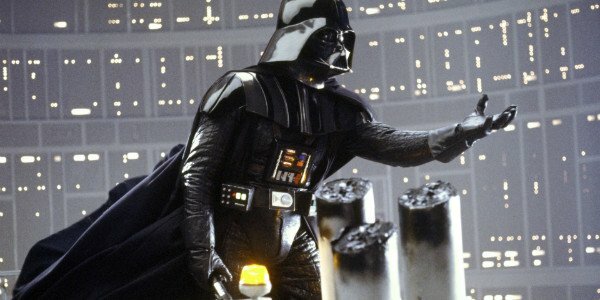 It’s to be expected, Darth Vader had been dead for years after all, but it turns out the dark jedi very nearly did make it into the final cut of the film. He would have been much more than a mask in that case. Apparently, there were plans at one time to include a recreation of the Luke Skywalker vs. Darth Vader duel on Bespin to be included in Rey’s lightsaber-induced flashback sequence. The Web site Making Star Wars has heard from multiple sources that such a scene was being filmed, or at the very least was being considered. While the moment was eventually scrapped for the film, a new Star Wars novel, Rey’s Story, has been released and when it makes reference to Rey’s vision, it includes a description of what we would have seen. The opening of the flashback sequence finds Rey standing in a hallway on Bespin, which would have moved seamlessly into her walking into the battle if that was the original plan for the sequence. The sequence is described in vague terms because Rey doesn’t clearly understand what it is that she’s witnessing. The audience, however, would have had a very clear understanding of what we were looking at. It’s interesting to imagine what the battle would have looked like from her eyes, and what the filmmakers would have done to recreate the climactic battle of The Empire Strikes Back with younger actors in place. It’s unknown at this point whether the fight scene was ever actually shot for the movie or not. It’s possible, probably likely, that it will show up as a deleted scene on the Blu-Ray release if it does actually exist. Although, it’s also possible it was only half finished. Even if the scenes were filmed, it doesn’t mean post production work was completed so the shots could be in a very rough condition. Would you have liked to have seen Luke Skywalker and Darth Vader battling again during Star Wars: The Force Awakens?